Fagus sylvatica purpurea is a large, rounded, spreading tree boasting red foliage in the spring that turns deep purple/green in summer and then bronzed for autumn. Small fruits, known as beech mast, are produced in the autumn and are popular with deer and squirrels. This delightful beech tree with smooth, grey bark will grow to an estimated height and spread of 10 x 6 metres in 20 years. This Purple Beech tree is suited to all but wet soils, and can tolerate exposed sites. 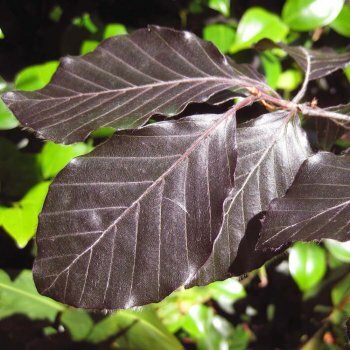 Fagus sylvatica purpurea is often used as a hedging plant as it holds its brown winter foliage, sometimes until new leaves emerge, making it ideal for year round screening. Plant in full sun for the very best colour. When planting beech trees, such as Fagus Sylvatica Purpurea, it is important to prepare the planting area well. Pot grown beech trees can be planted at any time of the year. You will need to carry out the following to prepare your planting site.